Aluminum may not be the first material that comes to people’s mind when they contemplate new railings for their home. But aluminum railings are generating a larger following by the day as more homeowners begin to realize the benefits of this long lasting alternative to wood, vinyl and iron. Corrosion Resistance – In an environment like that of Toronto, where outdoor railings can sit for weeks or months buried under ice and snow, the fact that aluminum is resistant to corrosion, rust and rot makes it an ideal material for the area. This fact alone has accounted for many new converts to aluminum railings. Ease of Maintenance – Powder coated aluminum railings are virtually maintenance free. They’ll never need to be repainted and because they don’t rust or rot, you’ll never have to replace sections. Simply give them a wipe down once in awhile and you’re good to go. 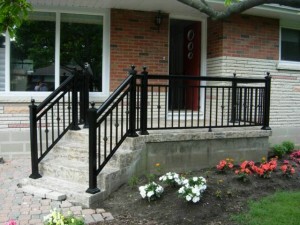 Affordability – Aluminum railings are cheaper, lighter and easier to maintain than iron railings. And while they’ll usually cost you more than wood, they won’t need to be repainted or replaced after being buried in the snow all winter; which means that over time they offer better value than wood as well. Beauty – Aluminum? Absolutely. Aluminum railings come in a variety of styles, colours and finishes that rival any other material. In addition you always have the option of painting them should you want to. Given all that there’s no reason you can’t wind up with exactly the aesthetic look and feel you’re after. Aluminum railings in Toronto are finally getting the recognition they deserve and as a result are becoming an increasingly popular choice among Toronto homeowners. RJ Aluminum Railings Toronto is one of the GTAs top suppliers and installers of these versatile and durable home decoration solutions. Call us today on 416-887-7069 to learn more about aluminum railings and how easy and affordable it is to replace your current high-maintenance wood or iron railings with affordable, durable aluminum.